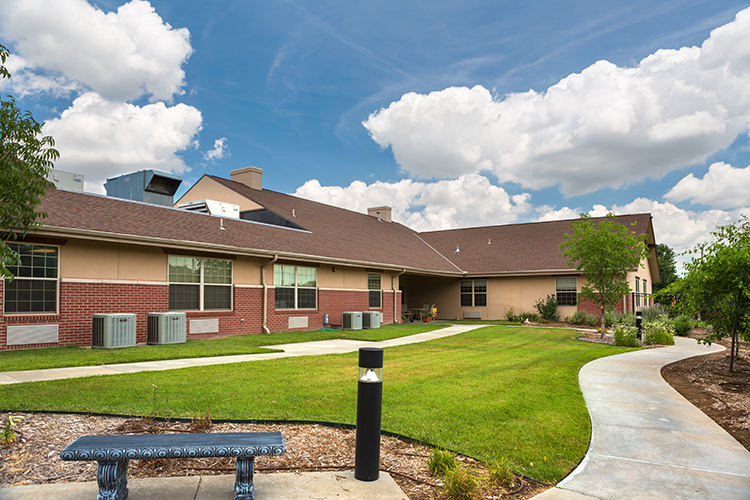 An award-winning skilled nursing facility in Wichita, Kansas. Opened in March of 2008, Family Health and Rehabilitation features four houses with 16 private rooms, for a total of 64 rooms. Each house has its own dedicated staff, living area, dining room, and kitchen. The facility features 24-hour staffing and provides a wide variety of care to residents needing skilled nursing intervention. Unlike traditional skilled nursing settings that have long, double-loaded corridors, these facilities are much more like one’s own home, where bedrooms are located short distances from the living and dining areas. In addition to the unique design, these facilities have a rehab/wellness centric operating model, offering physical, occupational and speech therapies. The rehabilitation department serves both resident and outpatient needs.